Garlic Escapes: Do you believe in miracles .... YES! Lightening things up a bit, let's honor the Miracle on Ice in which the American hockey team, composed of collegiate players and amateurs, defeated the heavily-favored Soviet team at the 1980 Winter Olympics in Lake Placid. That game took place on February 22, 1980. The American team went on to defeat Finland for the Gold Medal two days later. I attached a picture of fresh figs because they're pretty, but they're not available until May. Fortunately, this recipe calls for dried figs and fig molasses so you can get you fig fix year-round. The recipe from Chef Paul Sorgule, the former Executive Chef at the Mirror Lake Inn, a truly breathtaking inn on the shores of Lake Placid. I love this notation from the inn's menu: "All dishes contain onions, garlic, scallions or shallots in their preparation but some may be substituted or altered upon request." (Italics mine). Dredge the chicken breasts in seasoned flour. Heat the clarified butter and oil and light brown the chicken on both sides. Discard the oil/butter. Blanch the carrots, rutabaga and pearl onions. Deglaze the hot chicken pan with brandy and allow to evaporate. Add the chicken stock, vegetables, figs and chicken. Cover and place in a 350 degree oven for 10 minutes. Return to stove, uncover and reduce till the sauce coats the back of a spoon. Assemble on plate by distributing the vegetables among 4 plates, top with 2 pieces of chicken each, mask with a small amount of sauce, drizzle each plate with fig molasses and garnish with chopped parsley. 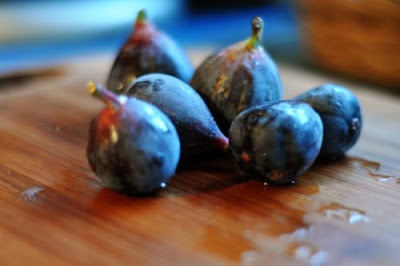 * Fig molasses are a sweet, ancient specialty of Calabria, "the toe of Italy's boot" on the map. They're available at specialty food stores and are amazing on pancakes. You can substitute regular molasses if you're out of fig ones.